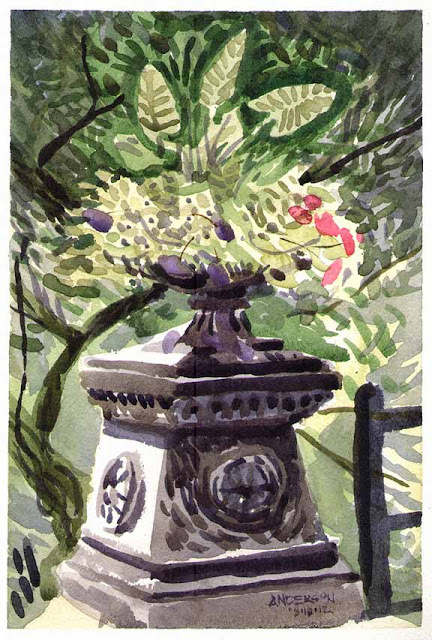 I spent several Sundays this summer sketching in Tower Grove Park with other Missouri Plein Painters Association artists. 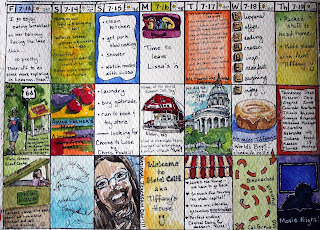 I have been working in watercolor in panoramic format with the idea that I would later develop these sketches into much larger studio paintings. This pavilion is the site of weekly band concerts throughout the summer as well as a popular spot for weddings. I have sketched here many times before but not from this side with the landscaped island in the foreground. 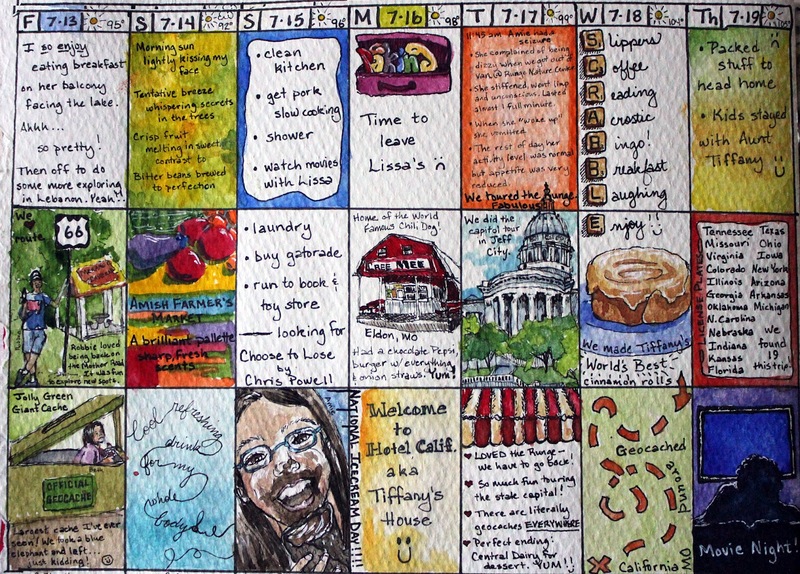 The colorful scene seemed to lend itself to the page design and I completed it on location in about 2 hours, a bit longer than what is considered a typical "sketch." 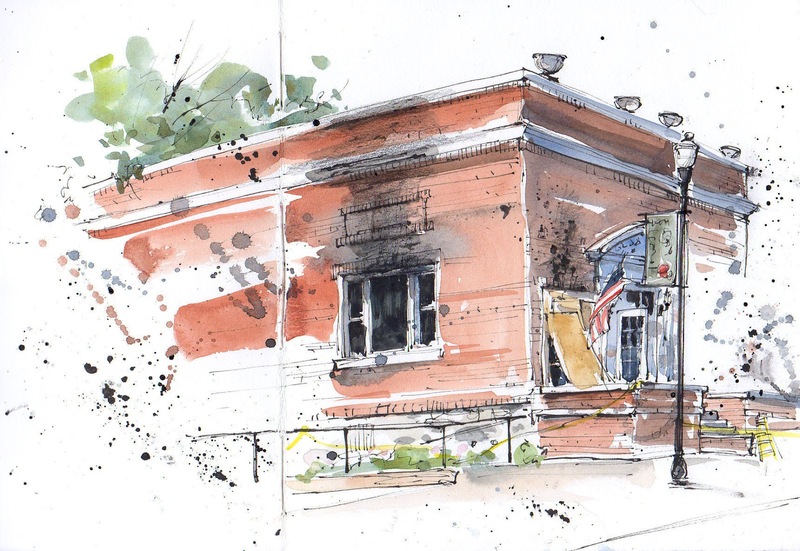 Victorian Pavilion, Bandstand, Tower Grove Park, 07/15/2012, Michael Anderson, watercolor on Arches 140lb cold press, 8" x 23". Kansas City - Looking East from 19th & Broadway. I work just around the corner from a community garden that is a wonderful oasis in the city. I sat on a bench in the garden to draw this scene. The garden is on a hillside that slopes down from where I sat. I was looking over the tops of some of the plants for this view. Actually drawn over a few days with watercolor added later at home. I had fun with this one! I was thinking one day about how my horizons have expanded, thanks to sketching and the online community of sketchers, worldwide. My life is infinitely enriched. 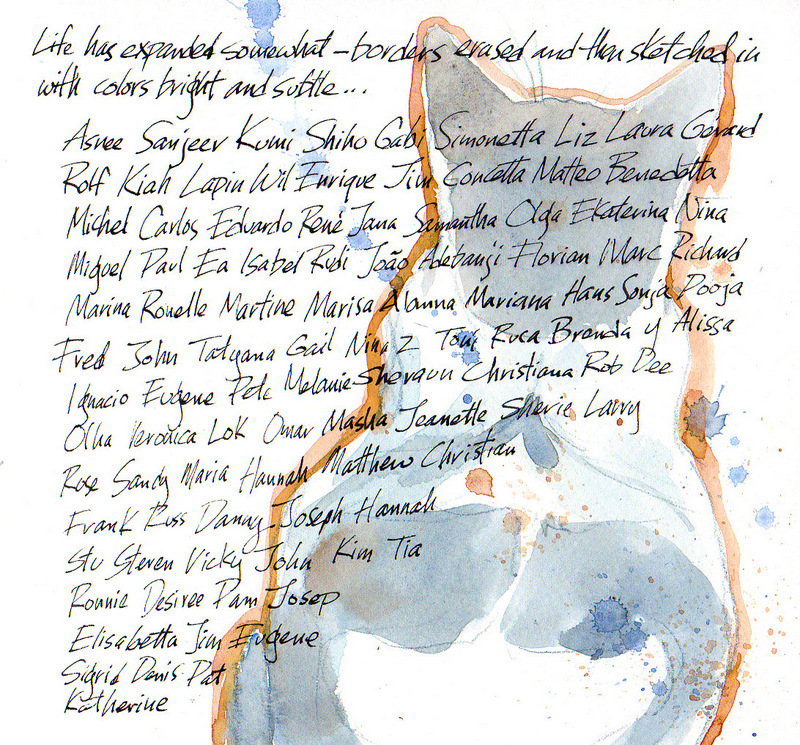 So thank you to ALL of you, and if your name isn't here, it's only because I was working from memory. At my age, that's tricky! And this is a most urbane cat...we take responsibility for his care, but really he is the neighborhood ambassador. We were seated right in front of the big windows at The Farmhouse, which in fact ISN'T, it's a wonderful restaurant in the City Market area...right where I had a great view of this ornate building. Fortunately, I didn't have too much time, so only suggested the design under the roofline...I got out the Hero pen and laid down some quick squiggles. This is the next floor down...they don't make buildings like that any more! At the center of Lafayette Park on the city's near south side is a footbridge that crosses over a lagoon. The pond is below street level and surrounded by lush plantings that are all maintained by neighborhood locals. I have always admired the planters that serve as corner posts to the steel and concrete bridge. 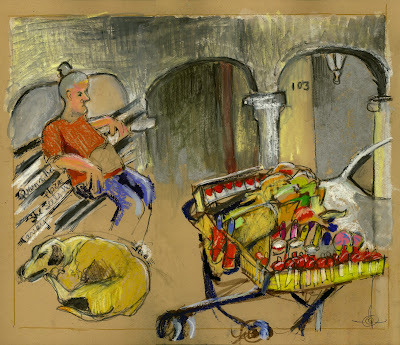 I am including this sketch in my upcoming show at Gateway Gallery which coincides with th St. Louis Art Fair. If you are in town for the event stop by the gallery which is just one block from the fairgrounds to say hello. 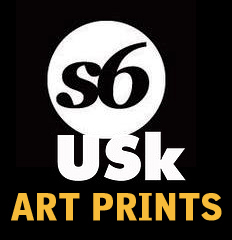 I plan to be at the gallery most of the weekend and I look forward to meeting fellow USkMidwest artists, followers & friends. Lafayette Park Planter, 2012, Michael Anderson, 9" h x 6" w, watercolor on Arches 140lb cold press. Quick sketches of the Red 5 at the Ice House. I met a friend at the Ice House for some awesome jazz a few nights ago. There is something about drawing in the dark while everyone is so focused on the music that lends an odd but public privacy. I have always avoided drawing people directly, but lately have been tackling it head on. That may be why I am posting the sketch without the photo. I tried to catch the energy, but I doubt the people would recognize themselves just yet. 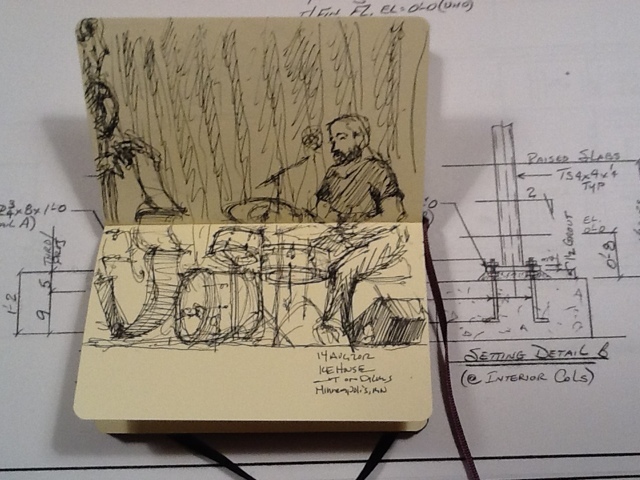 Before this set was a rare drum duet that begged to be sketched, all the ovals and cylinders and lights, but I also had a responsibility to listen to the hard work on stage. Maybe next time…. Airplanes...Malinda's dad used to own one, so she really understands how they're built. The hangar just to the right of this one is where they had a huge BBQ spread. The Fokker triplane in the background was a magnet! All in all, it was a great sketchcrawl, even though there were only a few of us. The food was great, the pilots were terrific, the music was from the 40s and 50s--jitterbug, Sinatra--and we had a ball. The dogs compete against one another in a number of categories, go through their paces, or just lie around with their doggy tongues out, posing. There were several rescue operations represented...I hope most of the animals found good homes, they were gorgeous! And did I mention I love dogs? Marble busts on granite columns of Rossini, Beethoven, Wagner and other classical composers surround one of the most elegant Victorian gazebos in Tower Grove Park. 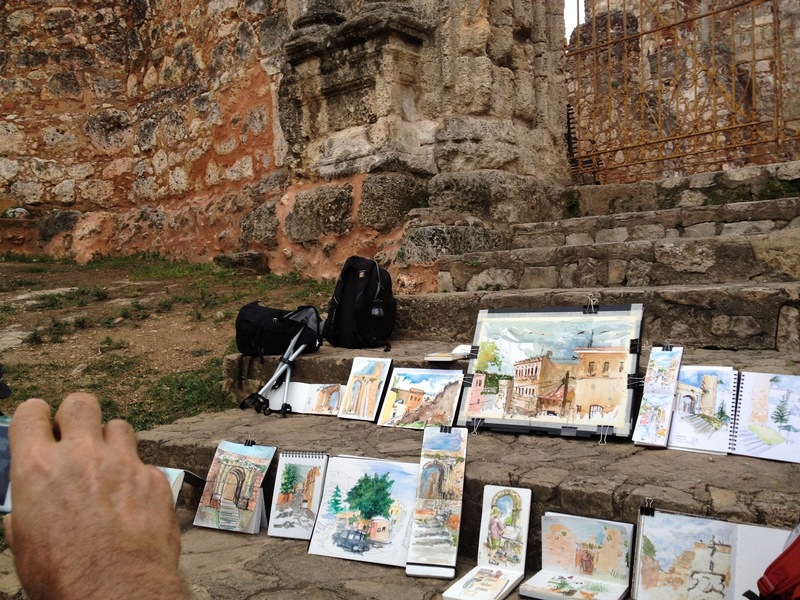 This sketch depicts a portion of the formal circular pathway around the structure and was painted on a Sunday morning outing with Missouri Plein Air Painters Association. The piece was accepted into a landscape themed exhibit called Lay Of The Land which opens next week at the St. Louis Artists' Guild. Cloud Gate, a.k.a. 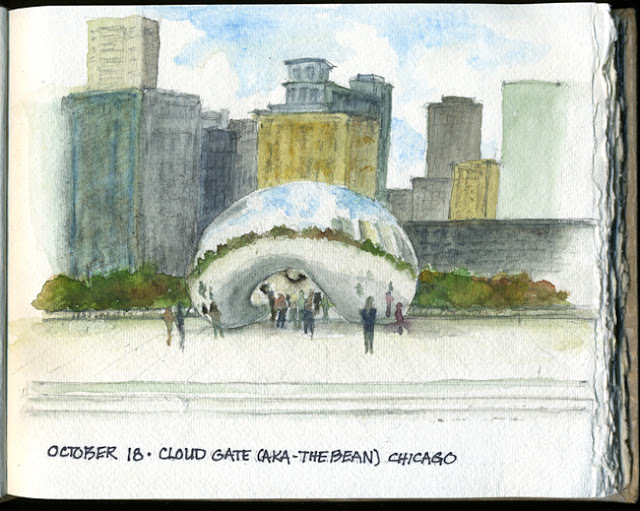 the Bean, in Millennium Park in Chicago is a go-to-place for tourists and artists alike. Watching as people experience the Bean for the first time is great. It brings out "the kid in the funhouse" in everyone. 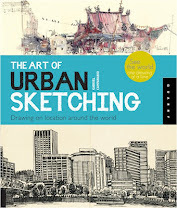 Last week I was there with the Chicago contingent of Urban Sketches and Miriam Ben from Munich. It was a great time. Thanks to Alex and Miriam for setting it up! 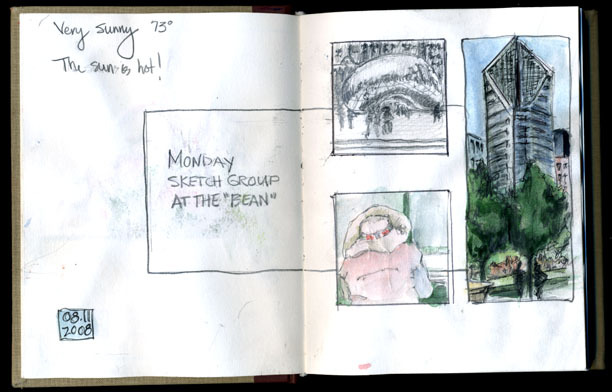 Our Monday sketch group was there yesterday but sadly, I couldn't make it. (Um - maybe not so sadly since it was raining all day.) I've sketched many of the features of Millennium Park but I figured I'd post sketches from a few past outings to the Bean, different size sketchbooks, different types of paper, different levels of success but always worth the trip! 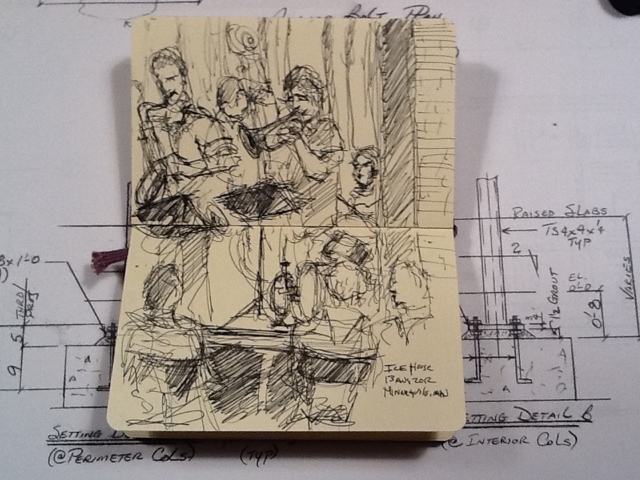 USK Chicago have hosted our first visiting Urban Sketcher! 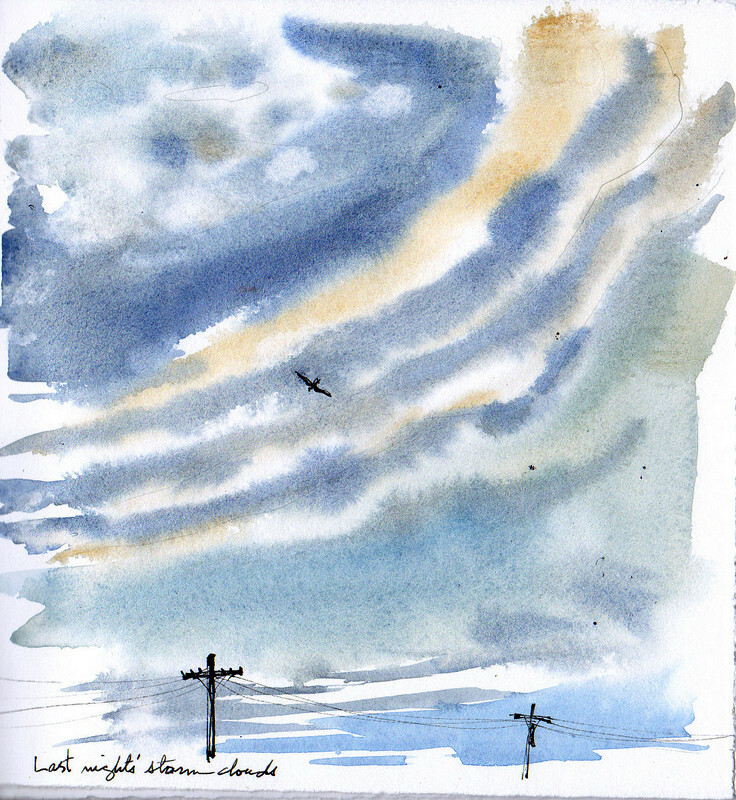 Miriam Ben from Munich Germany was in Chicago for work and went sketching with us. We took her to sketch to Millennium Park, to The Bean. Officially it is Cloud Gate sculpture, but I don't know any Chicagoan who uses this official name. Miriam, it was wonderful meeting you! And here we seem to have doubled in number! A group of kids got very interested in what we were doing. Pablo discovered us first, but wanted to keep this discovery to himself. He kept sending the rest of the kids back their parents. But Giola, Lucia and Robin would not be deterred and milled around. Then they wanted to draw with us. Sheets of paper and pencils were produced and shared, and we were in business! Then Lucia wanted to paint! Then the others wanted to paint! No problem! Paint we all did. Miriam was fast and made a delightful sketch of the young artists. 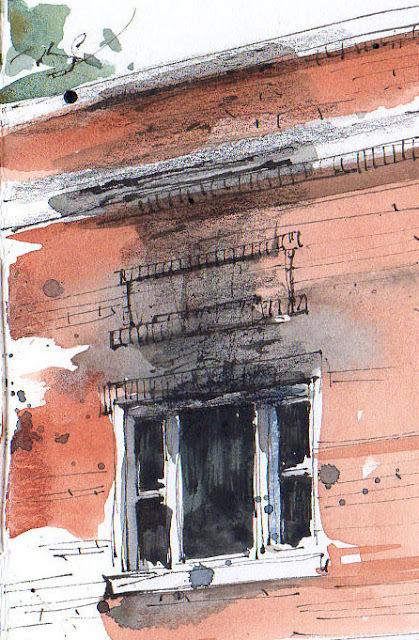 I decided the ink and watercolor alone didn't capture the effect of the soot left by the smoke pouring out the window...I added black colored pencil and THAT is more like it. I was on the parks board for many years, President for part of that time, and had a lot of memories of this place--I had to go sit on the street and sketch it. We watched for a moment outside the restaurant and then ran for home. Looking toward the east, we couldn't tell if it were raining tan, or raising a dust storm amongst the debris, and that's just what it was...the alley looked as if IT were on fire with the plume of limestone dust. A restaurant in the next town had flames shooting from the roof, and trees were down all over, along with a LOT of leaves and branches. Hero bent-nib calligraphy pen and watercolor. 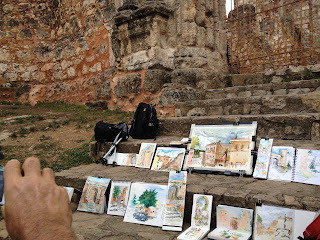 I've attended all three of the Urban Sketching Symposium: Portland, Lisbon, and, this July, Santo Domingo. It's hard to encapsulate the experience; it was just SO expansive. I know from previous years, the Symposium--the things learned and the other artist met--keep expanding and feeding into my ongoing practice of drawing--long after the 3-day event. I'll just give you a peek. On the left is one of my sketches from Brazilian artist/architect Eduardo Bajzek's workshop Straight to Colors where I used artist markers for the first time (!) 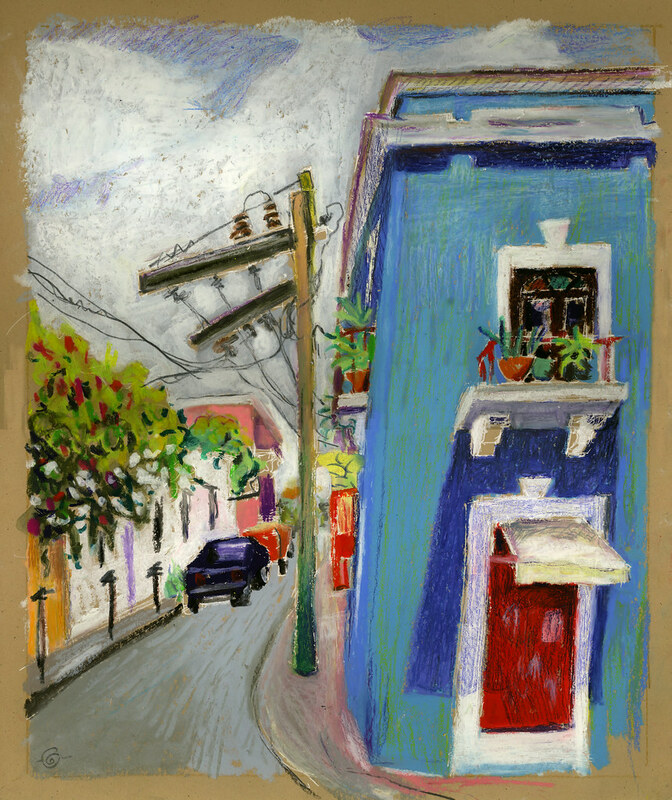 to develop a drawing through areas of color mass and tone, de-emphasizing line. A multi-media enthusiast, I couldn't keep my hand out of my colored pencil pouch to finish this one up. My husband and I arrived a day before the start of the Symposium. I was able to register, start meeting the early arriving other artists, pick up my treasure-trove goody-bag of artist materials (including the Laloran watercolor sketchbook used below), and start sketching this vibrant, foreign city of Santo Domingo. Trying new things, being taken out of ones comfort zone is a goal of the Symposium workshops. 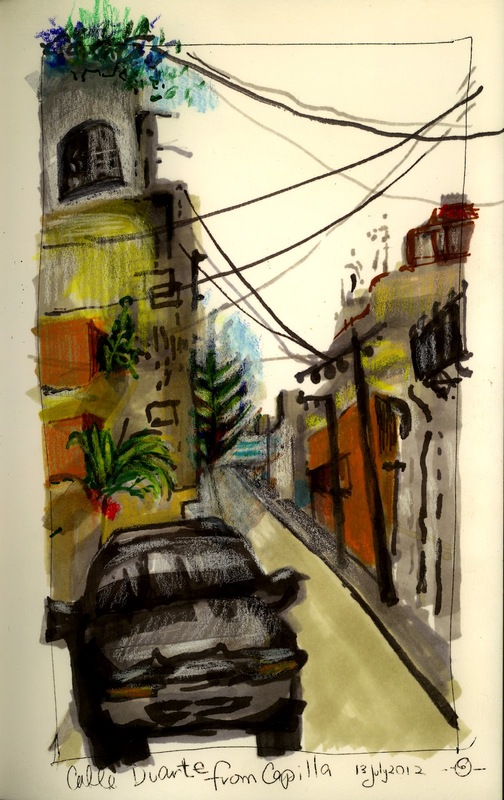 And that is what happened for me (see below) with my very first workshop Improvising with line and color: the Urban Sketcher as Storyteller, under the exuberant guidance of Spanish artist Inma Serrano and Dominican artist Orling Dominguez. 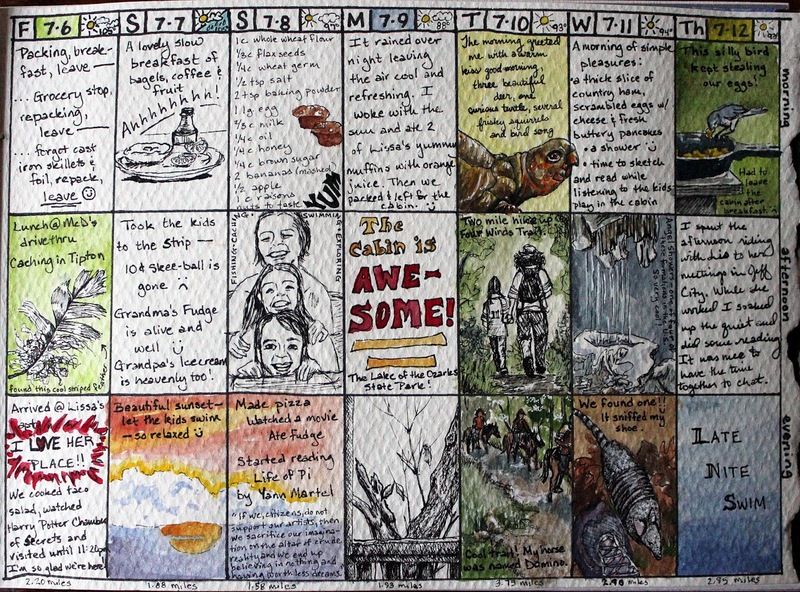 Create a drawing that incorporates a smattering of images and impressions to tell a story of place and time. Use words. It's always exciting at the conclusion of a workshop for all to lay out what they had done. Here's the collective result of Canadian artist Marc Holmes's watercolor workshop Tea, Milk and Honey at the Ruinas de San Francisco. 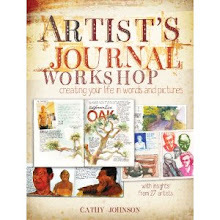 More workshops, more amazing inspiration from workshop leaders and other Symposium participants alike. If you want to see more, here's my flickr set of photos and all other drawings I did relating to the Symposium. And if you'd like to see more of everyone's results go to Symposium flickr group or the Symposium blog. 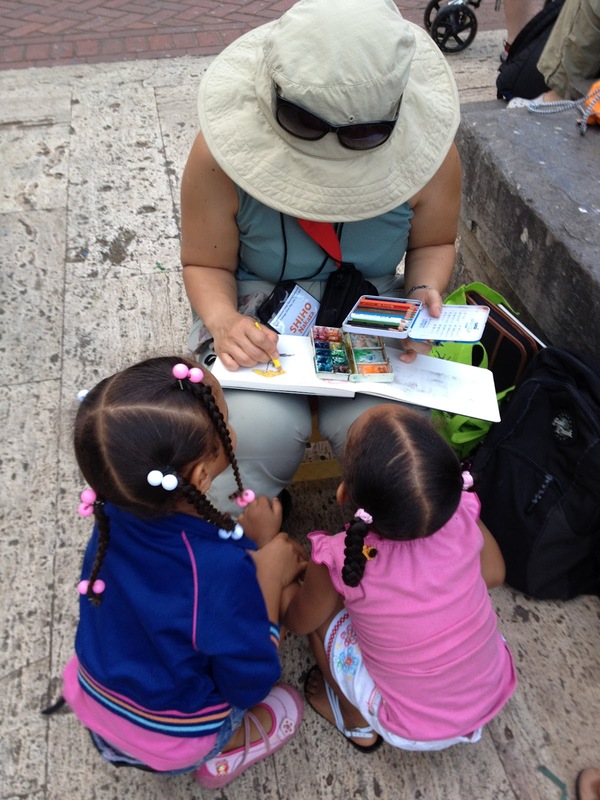 On a final note, I can't resist sharing with you this one photo of Urban Sketcher Correspondent Shiho Nakaza from Santa Monica, California at the Saturday Sketchcrawl in the Parque Colon on the last day of the Symposium. For me it captures, the amazing joy and sharing that happens when we get out on the street and sketch. Gotta go. Hope you enjoyed my glimpses from the Symposium. I'm now more excited to draw on sight then ever!! 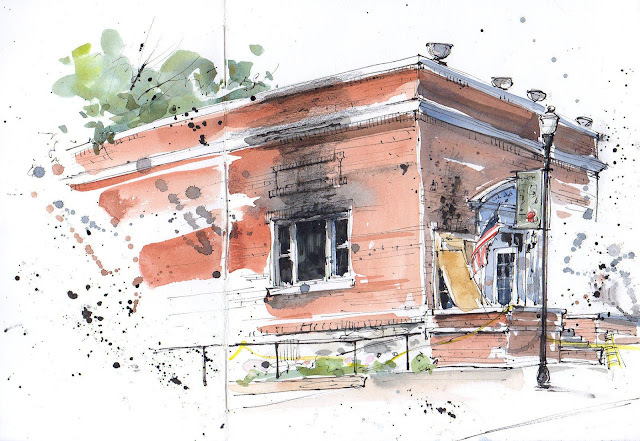 I've got a slew of drawings that are mine to draw of Cedar Falls, Iowa and who knows where else. breakfast treat, a photo by vickylw on Flickr. Since I was driving to Wichita anyway to buy a few groceries, it seemed like a good time to treat myself to a chicken biscuit and a sketch. And stand up for freedom of speech. Our second week we ventured back onto Route 66 for a spell and toured Missouri's State Capital. Family vacations are the highlight of my year, but I generally struggle with keeping up with both the family activities AND sketching. This grid was my attempt to do a little of both. 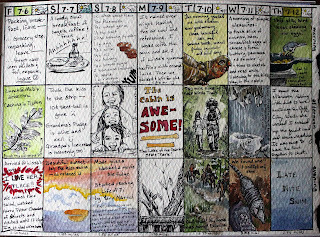 Quick sketches were done in ink and then details and color were added later at leisure. We divided our time between visiting a friend who's recently moved to the area and camping at the Lake of the Ozarks State Park. It was absolutely gorgeous! They have never allowed hunting there so the animals were perfectly happy to share space with us. A family of deer trooped through each morning about 6:30, our favorite turtle came to say hello around 8am and a friendly armadillo hung out with us for over an hour! We rode horses, went cave exploring and hiked some of the trails. The cabins were quaint and though they didn't have running water, they DID have air conditioning. (An extremely important detail during 100+ degree days.) We had a fabulous time.